Blade length :　47.8 cm or 18.81 inches. Sori :1.35cm or 0.53 inches. Width at the Kissaki : 2.18 cm or 0.85 inches. Shape : Regular width and thickness Wakizashi. The Kissaki is relatively long. The Jigane is beautidul Osaka Jigane. Hamon : Nie Deki, Notare Hamon with thick Nioikuchi. The Habuchi is soft. There are Ko-Ashi. Boshi is around Midarekomi style. Inoue Shinkai. Usually this Kunisada is called Oya-Kunisada. 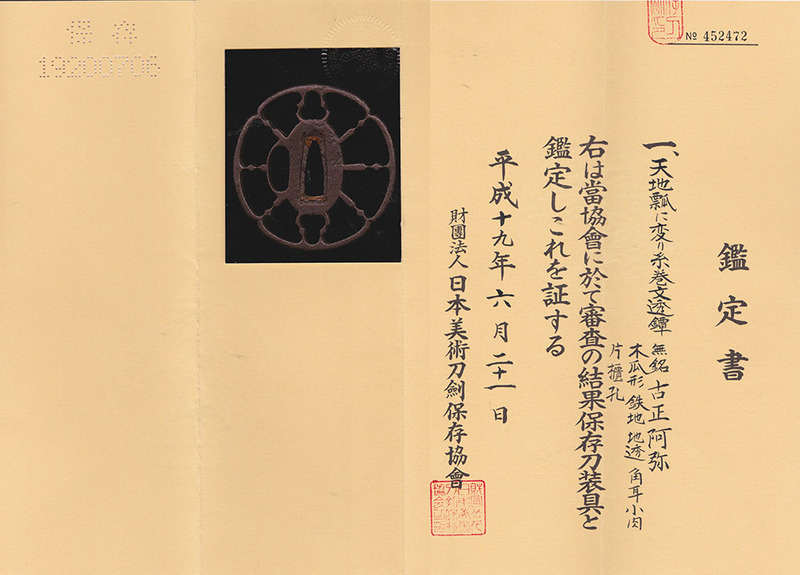 in 1590 in Hyuga province, present Miyazaki pref. He became a pupil of Horikawa Kunihiro at Kyoto. Kunisada went to Osaka and trained many excellent pupils. It has been an accepted opinion that he was the founder of Osaka-Shinto. in 1623. He passed away in 1652. Saya : Black and red color Saya. and distinctive Itomaki(spool) design engraved in openwork. It is classical style iron tsuba. Menuki : Noshi design is engraved with gold color. Fuchikashira: Butterfly and wave are engraved with gold color. 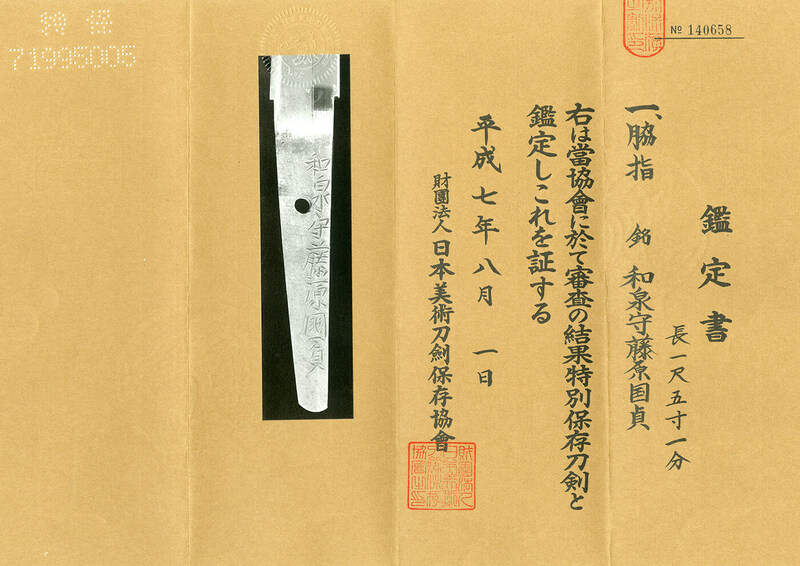 From Aoi Art : This blade is typical Kunisada.